So says James Turk in excerpts from an interview with Eric King of King World News. Lorimer Wilson, editor of www.munKNEE.com (Your Key to Making Money! ), has edited the excerpts below as a teaser to entice you to read the entire interview. This and the previous paragraph must be included in any re-posting to avoid copyright infringement. 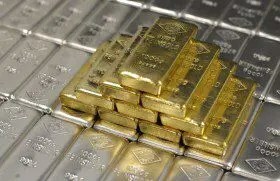 more and more people are starting to understand that gold is a safe haven….so the money coming out of the stock market is not only going into German and US government paper; it is also going into gold and silver, which is a trend that will accelerate as the crisis worsens. 2. Why, Pray Tell, Would I Want to Own Gold?? 3. If You Don’t Think Gold IS a ‘Safe Haven’ Then You Don’t Know the Meaning of the Term!